A few weeks ago, I boarded a plane out of the cold, snowy, still winter-laden northeast, and headed south. My trip to Houston was two-fold in it’s purpose, a bit of business, but mainly a good visit to my uncle and his sunny welcoming home. Emerging from the plane, I felt a strange chill in the airport: ah, yes, airconditioning, they already need airconditioning. The rodeo was on, the sun was shining, and it was perfect for playing in the backyard with the dogs and walking around the museums. We had a great time, and I was once again reminded that cold, gritty, expensive cities (ahem, ny) are not the only way to go in the U.S. There was sunny weather and Live Oak-lined boulevards, art galleries and live jazz, good food, good wine, good friends and even a baby in a Mexican sombrero. There were discusions of making homemade baking powder and my grandfather’s love of all things cornbread (recipes to come soon! 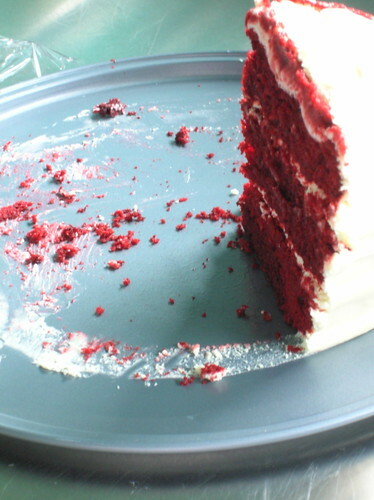 ), and there was red velvet cake. 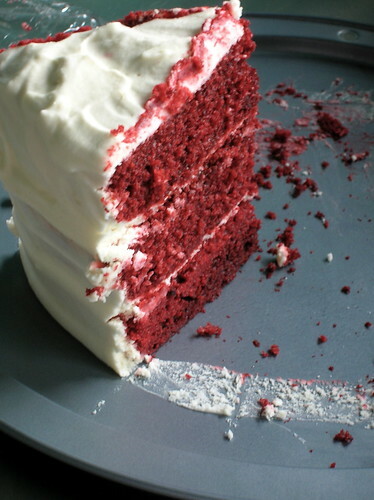 Yes, Red Velvet Cake. I don’t want to overshadow the Blue Bell ice cream, chicken fried steak, tortilla soup, bbq, fig jam, Vietnamese food, pecans, and Brown Paper Chocolates that I should be telling you about, but let’s talk about that Beauty Queen of a cake. Being a girl of Southern roots, I’ve always had a thing for red velvet cake. Maybe it’s the shocking hue, but I think it’s more about the tender-crumbed cake paired with delectable cream cheese frosting. And while red velvet has gradually been gaining popularity in the northeast (often with unfortunately insipid icing), it was recently catapulted to stardom with a feature in the New York Times. I had, of course, clipped the recipe and filed it away, but you can’t imagine how pleased I was when I arrived in Texas to find my uncle had beat me to it and already made the thing. If the pictures of the towering three-story beauty aren’t evidence enough, let me tell you that this is the real stuff. Moist, flavorful, good cake. And that mascarpone frosting? As my uncle said, "we had to pour the extra down the disposal so we wouldn’t eat the whole bowl." So if you were thinking (as I had thought when I clipped the recipe) of substituting your usual cream cheese frosting, I’m here to tell you to take the dive into caloric excess. It’s worth every bite. To wrap things up, my uncle also took me to Central Market one evening so I could cook dinner, and I made a nice little saute of Shrimp and Snow Peas in Spicy Black Bean Sauce. This comes together quickly and has a satisfying bite to it, I served a simple red-wine braised cabbage on the side. This has a surprising amount of red food coloring in it, so make sure you have enough on hand before proceeding. 1. Preheat oven to 350 degrees. Grease 3 round 9-inch layer cake pans and line bottoms with parchment. 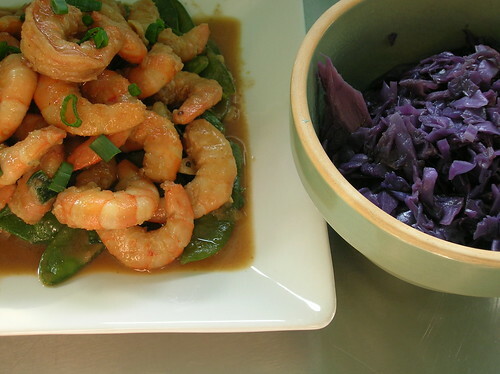 I do the snow peas seperately because I like them to be well-cooked and don’t want to risk over cooking the shrimp. If you’re not worried about your snow peas being on the crunchy side you can saute them at the same time with shrimp. 1. In a wok or large saute pan, heat 1 tbl of the oil. Add the snow peas and cook over high heat until they are softened and just beginning to show some color. Add 1/2 cup of water and continue to cook over high heat until the snow peas are softened and the water has evaporated, about 5 minutes. Transfer the snow peas to your serving platter. 2. Combine the soy sauce, sugar, arrowroot, broth or water, and red pepper in a small bowl and stir to dissolve completely. 3. Heat the remaining tablespoon of oil in the same pan. Add the garlic and ginger and saute about 1 minute. Add the shrimp and cook, stirring constantly, until they are just beginning to color, a few minutes. Add the black bean sauce and stir to combine and coat the shrimp. Add the soy sauce mixture and cook until the shrimp are pink and opaque and curled only 3/4 of the way closed and the sauce is thickened. 4. Pour the shrimp and their sauce over the snow peas in the dish, garnish with a few chopped green onions, and serve immediately. *Fermented black beans are avilable in Chinese markets, if you can’t find them you can substitute a bottled black bean sauce which is available in the Asian section of most supermarkets, but look for one that doesn’t have too many added ingredients. How wonderful that your uncle made the NYT red velvet cake for you. And I agree that mascarpone is far superior to regular cream cheese. With a cake like that, you're in! I love the cake and I especially love the frosting!!! Well done! what a line up! that cake is amazing. 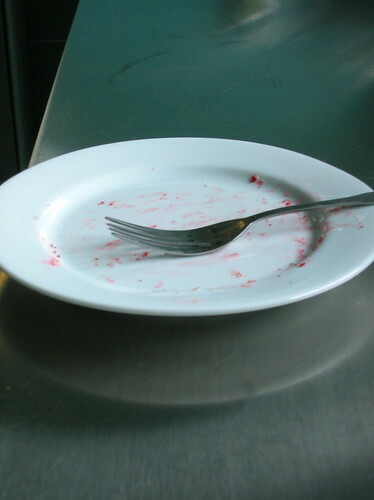 there is a red velvet cake bug buzzing around the blogosphere for sure, and they're all a mile high! Looks delicious... will definitely try using marscapone next time! Your cake looks beautiful, much better than mine turned out!! I love the idea of Mascarpone on the icing too! p.s. The prawns look delicious! This cake looks so delicious !!! I'm going to copy your recipe and try it myself. Oh Pilar I'm so glad, let me know how it turns out!